Movie Review: The versatile American actor David Dastmalchian writes, produces, and stars in “Animals”, the directorial debut from Collin Schiffli with whom he had already worked in “The Dark Knight Rises”, the former as an actor and the latter as an additional production assistant. The story, set in Chicago, shoves us into a fragment of the restless lives of Jude (Dastmalchian) and Bobbie (Kim Shaw), a couple of heroin junkies in love, who don’t have to worry about paying a rent since they sleep in their car, but have to struggle daily in order to assure their dosage. Driven by necessity and uncertainty, the couple relies on a few scams, some of them pretty inventive while others not really, to get the money that will be spent later on, when Jude visits their regular dealer. Arranging fake sexual encounters for Bobbie, stealing CD’s from music stores, misleading security guards with a missing-laptop scheme, and trying to obtain medicines from hospitals, are all part of their sordid enterprises. There’s an obvious complacency whenever they’re in possess of the drugs, and we can see them injecting themselves on the neck, feet and hands, whether in restrooms of restaurants, whether in cheap motel rooms. But not everything goes smoothly and the danger lurks from many corners, like when they were intercepted by violent, greedy cops, or when a new dealer fools them by selling a false substance. Sometimes the desperate predators are not so ‘animals’ and are taken by an occasional self-conscience and common sense - Jude felt incapable to ‘attack’ a mother rocking her baby in a stroller. 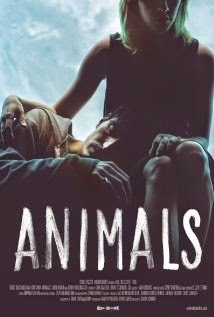 Taking the theme into account, “Animals” can be considered understated since the protagonists’ relationship surpasses somehow the addiction issue. An optimistic, well-intentioned finale is the culmination of a story that exhibited a tragic predisposition.